This year, eighth-graders and high school sophomores in the Chicago Public Schools will learn about former Chicago Police Cmdr. Jon Burge, who led a group of rogue cops known as the "midnight crew" in torturing suspects to get them to confess to crimes from 1972-1991. CHICAGO — This year, eighth-graders and high school sophomores in Chicago Public Schools will learn about disgraced former Chicago Police Cmdr. Jon Burge, who led a group of rogue officers known as the "midnight crew" in torturing suspects to get them to confess to crimes from 1972-1991. 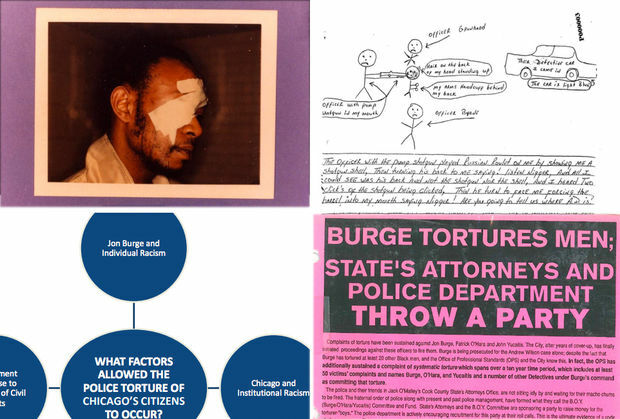 The new curriculum was developed as part of a sweeping reparations package presented by Mayor Rahm Emanuel and Chicago aldermen in 2015, which set aside $5.5 million to be shared among more than 100 Burge torture victims. Aside from getting a history lesson about the Burge case, students will learn about the racism and corruption that allowed the misconduct to go on for so long. The curriculum was developed by CPS officials in collaboration with Burge's victims, African-American community leaders, civil rights advocates, law enforcement, academic researchers and the Chicago Teachers Union, officials said. • Jon Burge and Individual Racism: The men who participated in the torture were racists and abused African-American men because of that racism. • Chicago and Institutional Racism: Racist policies and practices built into institutions in Chicago, from its Police Department to real estate, made it possible for the torture to continue. • Crime and Policing: Rising crime rates nationally led to more severe policing practices, which led to torture. • Government Response to Violations of Civil Rights: Government agencies and officials failed to act when the torture was reported to them, allowing the torture to continue. Teachers are encouraged to rearrange their classroom desks into a circle, called a "Talking Circle," at first. "The talking circles strategy ... is adapted from consensus-building traditions of some Native American nations. When used in the classroom, the talking circle is designed to provide a safe place for connection and dialogue; it is different from other classroom discussions because it does not involve persuasion or lead to a predetermined outcome but instead values personal experiences and stories and the opportunity to learn from one another," according to the lesson plan. Kids will be asked to discuss their own beliefs about police. In their circles, students will discuss their encounters with police. They'll also analyze where their beliefs about police come from, whether that's the media, a family member or their own interactions with officers. They'll also be asked to discuss how the feel about the neighborhoods they live in — and will learn why many are still so segregated (and how they got that way). Why did it take so long to get justice? Two days of class will focus on the response to the torture, not just from activists and torture survivors, but lawyers, journalists and groups beyond Chicago as well. The curriculum calls on the teacher to break up the class into groups to examine "activism cards" and make connections between the People's Law Office getting anonymous tips in the early 1980s to the United Nations getting involved in 2014. 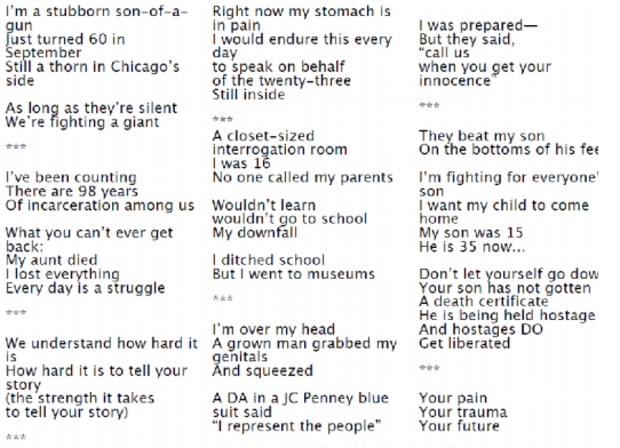 Students will be asked to create poems by patching together words used by Burge victims in their sworn testimony. It's called "found poetry." Teachers can choose which parts of torture victim Ronald Kitchen's videotaped deposition to show to students. In one part he describes being punched, slapped and kicked in the groin by Burge and others while being questioned for a murder he didn't commit but was eventually sentenced to die for. After asking one officer to use the phone during the torture, Kitchen says on the tape: "He took the receiver off the telephone and he conked me upside the head with it. ... He removed the cord from the phone, and then made a gesture to hand me the phone, and then asked; 'Do you hear it ringing yet?" The final assignment calls for students to design a memorial for the victims, though whether that's a sculpture, art or Encyclopedia of Chicago entry is up to the student. reparations package signed by the city. Teachers will remind students of this, and ask them to make sure their memorial "would educate the people of Chicago about the police torture scandal and ensure that the survivors and those who fought for justice are not forgotten."